Look, it’s three days until Christmas and things are slowing down a bit with the gay news and views, and really, the most interesting thing I’ve seen all day is this video of some guy taking his sled dogs on a bike ride through town! Yes, they follow along with him and have all kinds of fun, and this is all wonderful, therefore let’s watch the video while I live-blog it. Good dogs! 0:15 – OHHHH, we are so excited! We are not pulling a sled today! No, Daddy is getting his bike! OH boy, OH boy, OH boy. Where we gonna go? Where we gonna go? Where we gonna go? Oh boy! 0:30 – We are next to a creek and we are running around! Some of us are getting individual belly-scratches! I bet those Duggar babies don’t get any individual belly scratches, because there are simply too many of them! 1:00 – Running down the road, running down the road! Watch Daddy’s stick so we don’t run into bike riders coming the other way! 1:45 – Running down a different road, in the woods! 1:54 – Look at that other dumb dog barking at us! I bet he didn’t get any belly-scratches by a creek like we just did! Why are you barking at us, dumb dog? I bet you don’t even know how to pull a sled. Run some more, wag our tails, exciting! 2:15 – Busy street we have to cross! Look both ways, watch Daddy’s stick! Stupid cars. Secretly want to chase all of them, but do not tell anybody. 2:38 – Run across street! 2:45 – We are at a different creek and we get to swim this time! Daddy is coming with us and look how well we all stay together in a pack! This is because we are very good boys and girls. Who’s a good boy? Who’s a good girl?! That’s right, we are. 3:42 – Running down another road. Roads, roads, roads. Want to chase the horsey! And now on another road in the woods again, where there are no horseys. Sad tails. 4:15 – Field!!!!! Run free!!!!! Chase completely stupid birds!!!! 5:00 – New creek, new creek, new creek! This time we get to get in and chase the tennis balls that Daddy is throwing! He clearly did not bring enough tennis balls? Anyhow, splash through water chasing tennis balls! 5:20 – We are all doing a really good job chasing this one tennis ball together! No fights to the death or anything because good dogs. 6:00 – You know, a few of us ought to howl now. “hoooowwwooooooooooooo!! !” Good? Good. 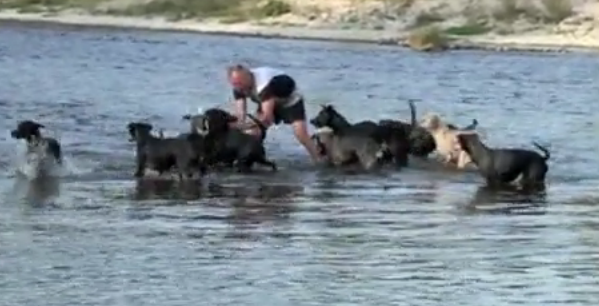 6:35 – More belly-scratches and excitement for being such good girls and boys in the water! What a good day! 6:45 – New road, gettin’ a little tired of this “let’s all run together in a pack thing.” Time to cut loose a little bit? Yes. Run all different directions! 6:50 – Blink and you miss it, but finally one of us has to poop. 7:47 – Busy street again. Aw, nuts. Wait to cross, wait to cross, kind of tired honestly, and then gooooooooooo! New road, more cyclists. Run, wag tails, etc. 9:10 – Almost home, almost home, almost home, wait…you guys? Did we just run past a damn baby hippo? NO, it is a dog who is fat! 9:17 – Home, in kennels! Good day!